The Visby Henley + Top will become your favorite wardrobe staple. 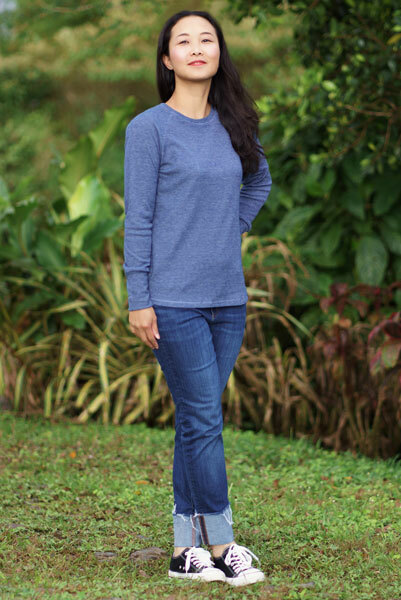 Wear this long sleeve pullover by itself on a warm day, or as a base layer underneath a snuggly sweater on a cool night. The Visby comes as a classic henley, but you also have the option to add a hood or skip the buttoned placket altogether. You also have the choice to add a bottom band. 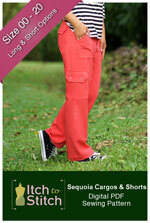 Primary fabric: lightweight four-way stretch knit fabric with at least 50% horizontal stretch and 50% vertical stretch. French terry, cotton Lycra jersey and other cotton blend jersey are good choices. Slightly heavier weight knit can be used in View B only but not in Views A and C because the intersection of the placket and neckband/hood can become too bulky with thicker fabric. 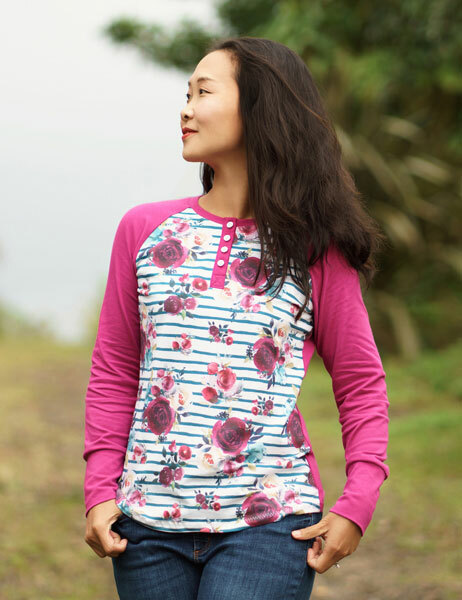 You can choose to color block the top by using different fabric for the front, back, sleeves, cuffs, neckband, hood and placket; use similar knit fabric for all these parts. Interfacing: very lightweight fusible woven or weft insertion interfacing for Views A and C (View B does not require interfacing). Compare your bust circumference (fullest part) to the “Body Measurements” table. 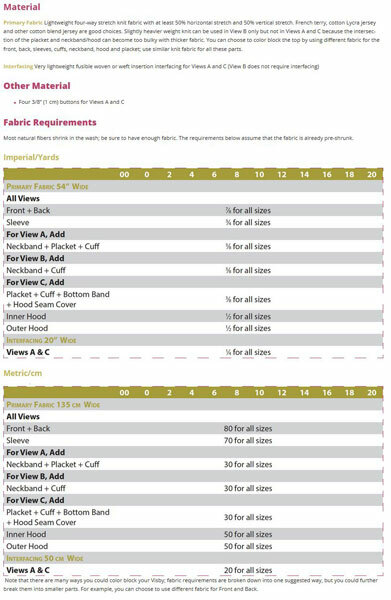 Choose the size that best fits your bust. Compare your waist circumference (narrowest part) to the “Body Measurements” table. Choose the size that best fits your waist. Compare your hip circumference (widest part) to the “Body Measurements” table. Choose the size that best fits your hip. If you are between sizes for the bust, waist or hip, choose the smaller size if you like your garment more fitted; otherwise, choose the bigger size. It’s OK to use different sizes. See instructions for details. If you are taller or shorter than 5’6” (168 cm), you should consider lengthening or shortening the top. See instructions for details. 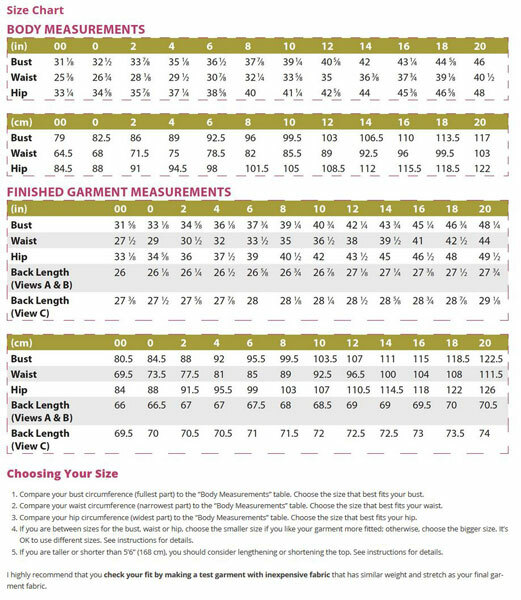 It is highly recommended that you check your fit by making a test garment with inexpensive fabrics that have similar weight and stretch as your final garment fabrics.